A frontier judge; British justice in the earliest days of farthest west. A life not chosen : the story of Ethlyn Trapp and her father : a prominent daughter of a British Columbian pioneer and New Westminster elder statesman. A pioneer gentlewoman in British Columbia : the recollections of Susan Allison. A richer dust : family, memory and the Second World War. A voyage round the world in the years 1740-44 by George Anson. Above the sand heads: firsthand accounts of pioneering in the area which, in 1879, became the Municipality of Delta, British Columbia. An enterprising life : Leonard Frank photographs, 1895-1944. Arthur Currie : the biography of a great Canadian. Awakening continent; the life of Lord Mount Stephen. Volume I. 1829-91. Biographical dictionary of well-known British Columbians; with a historical sketch. Blazing the trail through the Rockies; the story of Walter Moberly and his share in the making of Vancouver, by Noel Robinson and the old man himself. Bridges of light : Otto Landauer of Leonard Frank Photos, 1945-1980. British Columbia from the earliest times to the present, by E. O. S. Scholefield. Builders of Canada from Cartier to Laurier. Bush pilot with a briefcase; the happy-go-lucky story of Grant McConachie [by] Ronald A. Keith. Canada's patriot statesman : the life and career of the Right Honourable Sir John A. Macdonald. Captain James Cook, R.N. ; The great navigator and discoverer. (In Smith's Dock Journal). Item is a photograph of the Hon. 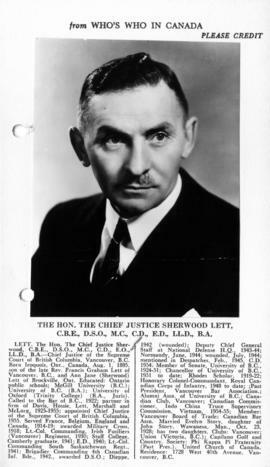 the Chief Justice Sherwood Lett, C.B,E., D.S.O., M.C. , C.D., E.D., L.L.D., B.A. affixed to a card page with biographical information, both are from Who's Who in Canada.